Want to get involved in the Pillsbury Bake-Off Contest without even having to turn on the oven? Cast your vote and help decide which apron will be worn by finalists as they compete for $1 million at the 45th Pillsbury Bake-Off in March! Adding a dash of designer fashion, Pillsbury has asked three former contestants from a top fashion design reality show to compete in a "Runway Challenge" and help design the official apron to be worn by finalists at the Pillsbury Bake-Off Contest. 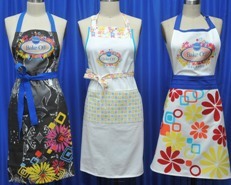 Althea Harper, Kara Janx and Carol Hannah Whitfield have each designed an apron to potentially be worn by the 100 finalists on the contest floor at the Pillsbury Bake-Off Contest finals which take place March 25-27, 2012, in Orlando, FL. You and your readers can visit the Pillsbury Facebook page to vote for your favorite and help decide which design should become the official apron of the 45th Bake-Off Contest. Hurry and cast your vote before voting closes on Monday, October 17th! I just can't imagine creating a Pillsbury apron and not using the Doughboy, sorry. I had a toy Doughboy when I was a kid, wish I still had him.